Keeping Up Appearances Installation Series, 2011- Pres. Ashley V. Blalock was born and raised in San Diego, CA. She earned an MFA in sculpture from the San Francisco Art Institute, an MA in art history from the University of California Riverside, and a BA in painting from San Diego State University. She was a resident at the Skowhegan School of Painting and Sculpture and Vermont Studio Center. 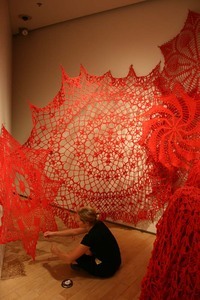 Her solo installation venues include the Nevada Museum of Art, the Lion Brand Yarn Studio in New York, and the Last Bookstore in Los Angeles, and her work has been exhibited in group exhibitions at the Craft in America Center, Mingei International Museum, and Arthouse at the Jones Center. Her work has been reviewed in the San Diego Union Tribune and by Fluent~Collaborative, and featured in Vogue Knitting Crochet and Interweave Crochet Magazine. Ashley V. Blalock lives in Southern California.